(March 4, 2003) Hong Kong's premier annual movie event is making an eagerly-awaited return this year. The 27th Hong Kong International Film Festival will take place from April 8 to 23. Presented by the Hong Kong Arts Development Council, the 16-day event will showcase nearly 300 movies from more than 40 countries. Buoyed by the resounding success from last year, the festival in 2003 not only continues to offer a delightful programme, but will, for the first time in the Festival's 27-year-old history, feature three new Competition events. In the line-up, Hong Kong International Film Festival 2003 will be screening such internationally acclaimed and award-winning films as "Far From Heaven", which stars Julianne Moore; Kitano Takeshi's latest production "Dolls"; the trans-racial romance "Dirty Pretty Things" with "Amelie" actress Audrey Tautou; David Cronenberg's subversive new film "Spider"; Venice Film Festival Golden Lion Award winner "The Magdalene Sisters"; and "The Ring" director Nakata Hideo's latest movie "Last Scene". 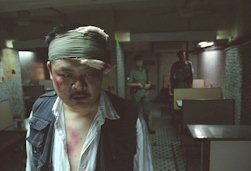 The two Opening Films are respectively, "PTU", the latest production by Hong Kong director Johnnie To, and "Twilight Samurai" directed by Japan's Yamada Yoji. "PTU" tells the story of a police patrol trying to recover a lost gun in the course of one long evening. Two years in the making, it is one of To's more personal projects, whose noirish mood and style bring to mind the director's award-winning "The Mission". 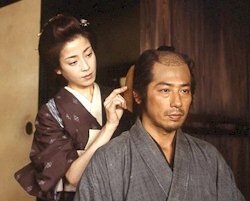 "Twilight Samurai" can be regarded as the samurai-era version of the Tora-san serial that Yamada-san is most famous for. Starring Miyazawa Rie and Sanada Hiroyki, it was named by Kinema Junbo as the top Japanese movie last year. The closing films are "Adaptation" starring Meryl Streep and Nicholas Cage, and "Cala, My Dog!" starring mainland Chinese actor Ge You. The major highlights of the festival include "Ozu Yasujiro, 100th Anniversary" and "Shaws on Screen". To commemorate the centenary of Japanese director Ozu Yasujiro, one of cinema's true masters, the Festival will screen more than 30 titles by the late director, making it the largest and most complete showcase of Ozu in the world. For aficionados of old Hong Kong cinema, the Hong Kong Retrospective section presents "Shaws on Screen". The legendary Shaw Brothers studio created literally hundreds of amazing films of all genres in the 1960s and 1970s. Now, 40 years on, the special programme showcases over 20 star-studded classics, many in restored new prints. The "Hong Kong Panorama" presents Jeff Lau as the filmmaker in focus. Lau, a maverick screenwriter and director, whose "Chinese Odyssey 2002" just took the Best Film award from the Hong Kong Film Critics Society in January. Fruit Chan's latest production "Public Toilet" also receives it first local screening in this section of the festival. In the section on documentaries, the spotlight falls on "Morning Sun", another joint effort by "Gate of Heavenly Peace" directors Carma Hinton and Richard Gordon. The film studies the historical causes of the Cultural Revolution from the perspectives of ideology and psychology, with plenty valuable footage from those turbulent years. The Festival this year will feature three international competitions. "Firebird Awards for Young Cinema" will screen 11 first or second productions by new directors, and eight digital films by young directors from the region will compete for two awards in the "Asian DV Competition".. An international jury made up of five world famous film personalities will pick the winners.In the "Humanitarian Awards for Documentaries", 12 movies contend for two awards. The jury consists of three veteran professionals from the documentary scene or journalism. All six winners will get cash prizes. Other festival highlights include "Gala Presentation", "Indie Power", "Midnight Heat", "The Avant-Garde" and "Animation". The film ambassadors of the Festival this year are young idols Wong Yau-Nam and Tsui Tin-Yau, the two members of the popular "Shine" group.